Yet again, drones have captured some of the most spectacular footage of wildlife from high above. 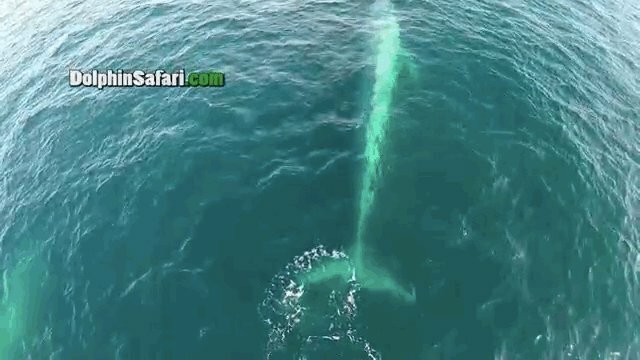 This video, taken by the captain of a whale watching ship off Dana Point in California, shows a whole yearbook of animals -- blue whales gliding through the water, gray whale moms and babies playing in the surf, and a massive pod of several thousand dolphins swimming with the whale watching boat. Captain Dave Anderson, who runs a whale watching company in the area, was astounded by the footage himself. "That was the first blue whale we've ever filmed with a drone," he said. "I could not believe what I was seeing as I looked through the special goggles that allow me to see from the drone's POV. This one whale was massive, probably over 80 feet long. And it was coming right at me in the drone!"